Upon my mother's return to the barn, she started moving furniture around and refining the space to meet her present needs. Since I'm now spending time there daily, I couldn't help but join in. Design is our shared love. The other day, she mentioned a need for something to set her ipod speaker/dock on. Later on, she wondered what to do with her favorite wooden soup crate. Its happy life as a coffee the table had recently ended when my mother reconfigured the dining area. I was staring at that crate sitting in the corner... now on its side. Always remember to turn things inside out and upside down to see their full potential. 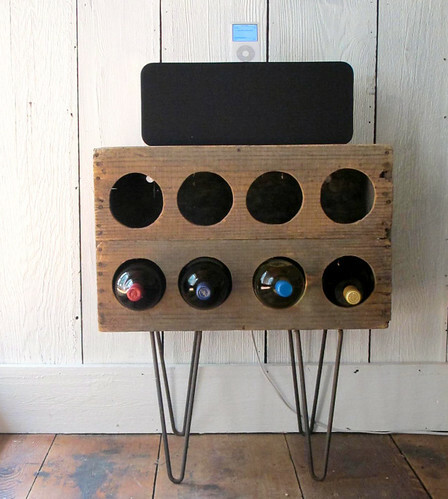 Those old soup can holes took on a new persona and looked like just the right spot to store wine bottles. If we could raise it up on legs of some kind, maybe it would be the right height for her music station. Legs... of course, my mother had the perfect thing: a set of hairpin legs she had removed from a $2 garage sale coffee table.They fit perfectly! 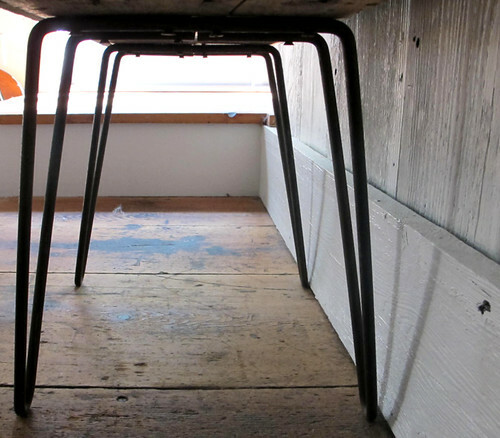 Hairpin legs can add a bit of mid century "oomph" to any base. Watch for those distinct legs on garage sale tables or purchase your own hairpins at the height that's right for your next project here. Add them to a slab of wood for a bench or a table, and you'll have a simple and unique new piece for your home. More barn diy is in the works for next week! Thanks, Rowena! I had a feeling you'd be checking in... barn posts, you know. 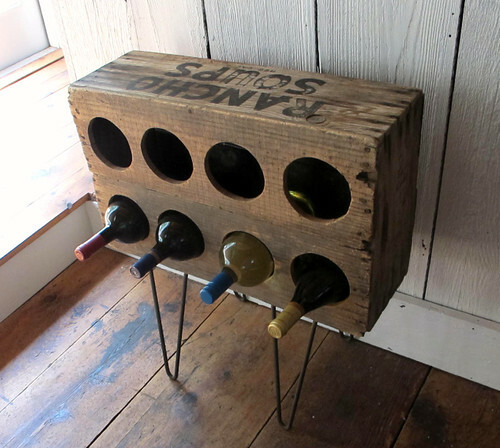 That's very clever and the hairpin legs make it. Would you mind if I posted your harmonica pictures? I am going to have a go at making one myself, but in the meantime, may I borrow yours? Hairpin legs often make me feel woozy. I imagine this lovely piece toppling over... or maybe that's just at my place! Katiecrackernuts- Feel free to choose a photo. Have fun making them! Maxabella- It's incredibly sturdy... no toppling, and my mother doesn't have any toddlers about. Hairpin legs on benches and tables would be the favored project if there are small children living near it. I love this project- it's a beaut! this is a wonderful creation. lovely. thanks for the tips of turning things in different orientation for new possibilities. Great idea. I love the way it turned out. Old and modern-ish all at once. Lovely!!!! i see tables and chairs with amazing legs but totally unsalvageable bodies by the roadside all the time.